"A Comprehensive Exploration of Solid Inner Game "
A detailed exploration of inner game & confidence and it's importance to attracting women. This product is very effective and contains some practical points for implementation. The price tag is very high for this product. Some of the concepts will be too abstract for some students, and the focus on 'mindset' and lack of 'techniques' may make it difficult for some to easily implement. This product is an in depth exploration of "Inner Game & Confidence". It is a strong product for beginners to advanced. However, intermediates will get the most value out of the product as they have the experience to understand the value of its principles and apply them more rapidly - this is the case for all inner game products. While this product is a solid exploration of inner game we recommend most men instead get Secrets of Inner Game. Secrets of Inner Game is both much cheaper (more reasonable value for money) and has better and more specific practical details to implement what you learn. "Most People Go Through Life in a Walking Daze." "The Self is Always Coming Through." "You Need to Get the Spiritual Side of Yourself Handled to Attract Women." These are just a few of the refreshing core messages from this product that bring some hard hitting reality to the development of 'inner game', its role in the mastery of dating and even your life. 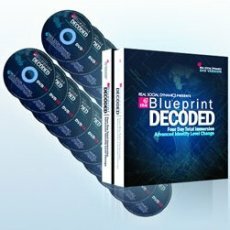 The Blueprint Decoded is the most detailed and comprehensive look into 'inner game' to date, was widely awaited by the market and did not disappoint. This was the most innovative dating advice material to come out in 2007. Starting from an exploration into what was formerly known as 'direct game' and advocated by some pick up artists (notably Shark and BadBoy), TD developed a new and innovative look into what attracts women based on "inner game". The content is relatively controversial when compared to the existing products of the time, as it goes into direct confrontation with the ideas behind why the pickup artist and dating methods of the time have enabled men to attract women consistently. In developing the principles covered in The Blueprint Decoded, TD completely rejuvenated and turned around RSD's approach and knowledge on attracting women. The principles in it have been used in their bootcamps and as a result thoroughly trialled with students and RSD's dating instructors since 2006/2007. For those that have read more broadly into self development they will realize that he has managed to combine teachings from many of the best sources of knowledge in the areas of spirituality, self development, seduction and pick-up and integrate them into The Blueprint Decoded. The end result is a truly original dating product. The content builds nicely in a step by step fashion, establishing a foundation of knowledge that at first may seem irrelevant or not useful, but which sets a strong base from which to build and apply the mindsets he advocates. As a bonus, when applied, they will also have a positive impact on other aspects of your life. The principles covered may take a while to implement fully, but will no doubt have a significant impact on both your ability to attract women and keep them. The great thing about this product, as with other inner game products, is that it addresses the underlying issues that sabotage your interactions with women. As a result it has an ability to improve the quality of your dating life for the longer term by making it considerably more natural and effortless. Inner game and confidence is probably the hardest skillset to teach and to transfer to students, but it has also been proven to have a very big impact on your dating success. TD has done a reasonable job in making this inner game content more easily implementable by giving a small number of practical rules and guidelines by which you should judge your actions and ensure you are staying on track. However, the content remains a bit abstract for some men to put into practice. It lacks practical advice on specific parts of your life and approach towards women where you can make changes to improve inner game. This is in part due to the product having been created in 2008 (a bit dated now). In comparison, a more recently released product from Brad P., Secrets of Inner Game is better at this. Secrets of Inner Game has better and more specific practical details to implement what you learn. This is a product for someone who is very interested in theory of picking up women and inner game. The exploration of inner game that Tyler takes you through in this will satisfy your need to understand why things work. It is a product that is best suited for someone of intermediate or advanced level with some success already behind them. This product is better for men who are advanced because of its strong theoretical element that can support those looking to develop themselves to mastery. If you are a beginner or intermediate that needs specific practical advice on identifying and fixing inner game issues - a better product (and much more reasonably priced one) is Secrets of Inner Game.